Blondie and Brownie: 4 & 20's New Fall Pie & Thanksgiving News! A few weeks back, I was delighted to see that Four & Twenty Blackbirds had started doing a bit of their pie production in the same kitchen where I work for Robicelli's. This has meant more than a few minutes lost to me admiring their gorgeous pies. 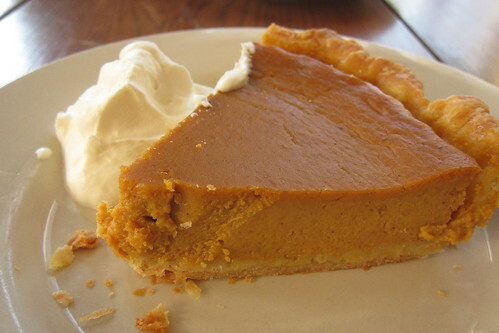 Last Friday, Melissa said she was making their newest flavor, Brown Butter Pumpkin. Matt Robicelli and I let her know that she had a whole kitchen of taste testers to her avail should she need feedback. I might not have gotten a taste Friday night, but Brownie, Lawman, Little B, and I all stopped by on Saturday for the new pie! Some of you might know that I'm late to the pumpkin game. I only started liking it about six or seven years ago, and I still won't say I'm deeply in love with it (or any other fall flavors for that matter.) But this pie tried to change my mind. 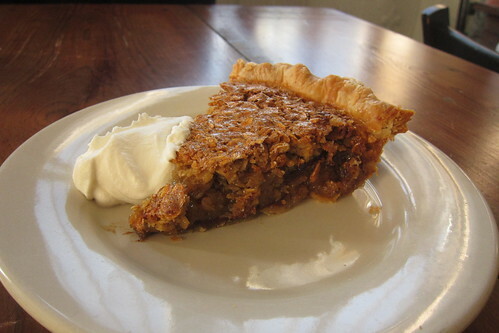 The pie is creamy and silky, with just the right amount of spices added, an all around win. I wasn't able to pick up a lot of nuttiness from the brown butter, but I might have if I'd been allowed to eat the whole slice-a certain blogging partner of mine ate more than her fair share leaving the rest of us with the crust. I do think I'll be stopping by again for a piece of pie without said blogging partner in tow. Melissa also let me in on how they'll be running the Thanksgiving show this year. To do away with the crazy around the block lines of last year, they are taking Thanksgiving orders. This looks phenomenal! I am drooling and it's barely 9 am! :) Thank you for sharing this. I am partial to my favorite desserts, but this looks like it might be one to add to the list.